Findings were published today in mBio. In large bodies of water, plankton are the collection of organisms unable to swim against the current. Phytoplankton refers to the autotrophic, or self-feeding, components of the community—the ones that can produce, often via photosynthesis, organic compounds like fats, proteins and carbohydrates from substances in their environment. Already, in many of the vast, warm regions of the ocean, phytoplankton must deal with the challenge of discriminating between phosphate, a scarce nutrient essential for cell growth, and arsenate, which is chemically similar but toxic. 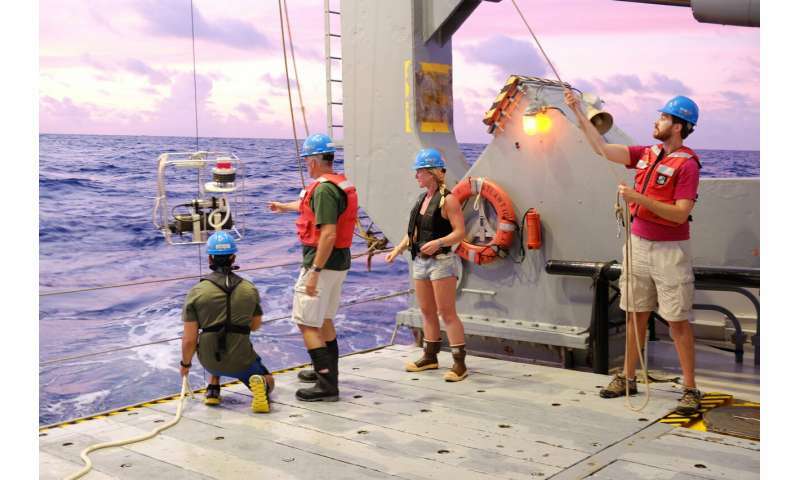 "Many phytoplankton, including the most common phytoplankton type in warm oceans, Prochlorococcus, detoxify arsenate by adding methyl groups," explains Kimberly Halsey, a microbiology researcher at Oregon State University and a co-author on the study. A methyl group is one carbon atom bonded to three hydrogen atoms. "We found that the most abundant non-photosynthetic plankton in the oceans, SAR11 bacteria, remove the methyl groups, releasing poisonous forms of arsenic back into the water," said Steve Giovannoni, distinguished professor of microbiology at OSU and also a study co-author. "That suggests that the methylation and demethylation of arsenic compounds create a cycle in which the phytoplankton can never get ahead—they're continually transferring energy to the arsenate-resistant SAR11." The process makes SAR11, in effect, parasites. "It might help explain why SAR11 are so successful, surpassing all other plankton in their numbers," Giovannoni said. The Sargasso Sea, the only region on Earth described as a sea that doesn't have any land boundaries, is a subtropical ocean gyre east of Bermuda; a gyre is a large system of circulating currents. Known for its deep blue color and distinctive, brown Sargassum seaweed, the Sargasso Sea lies between the Gulf Stream and the North Atlantic, Canary and North Atlantic Equatorial currents. "The Sargasso Sea is sometimes called an ocean desert because there is not enough phosphorous in the water to support large blooms of phytoplankton," Halsey said. "Ocean deserts are expanding as the oceans absorb heat and grow warmer." The parasitic arsenic cycle is a process that scientists predict will become more widespread as the Earth continues to warm. "The cycle might help explain why rates of photosynthesis in the ocean are sometimes much higher than we expect," Halsey said. "In other words, SAR11 is making the phytoplankton work much harder. One of the big challenges in oceanography is understanding what causes variability in rates of photosynthesis carried out by phytoplankton." Yes, this is exacly what BC needs. Warmer oceans. Now, if we could only have the lovely sandy beaches of southern California to go along with it!